Who doesn’t love a velvety rich alfredo sauce! Especially when its smothering pasta and mushrooms. Oh. My. God. So. Good! Such an indulging and comforting dish, I savor every bite when I order this at a restaurant. I don’t eat this on a regular basis but when I do I enjoy it to the max. No guilt, no regret. Healthy living means having a healthy relationship with food and that means enjoying heavy cream and pasta in their best forms every once in awhile. I wanted to recreate a dish I can eat at home more often that will deliver more fiber and nutrients. And my goodness have I figured it out! Seriously, I have been eating this all day. Send help. What I did was swap the heavy dairy-based cream for… cashews! Yep, I made a vegan alfredo sauce using cashews and I swear it works. So savory! Cashews are loaded with unsaturated fats which can help lower cholesterol and prevent heart disease. The fat and protein from cashews will also prevent blood sugar from spiking and will keep you fuller for longer. In addition, cashews also provide B-vitamins for energy, phosphorus, and a good dose of magnesium. Magnesium is an important mineral that plays a role in over 300 enzymatic functions and is needed for muscle relaxation. Adequate magnesium is also needed for good bone density and preventing osteoporosis. Magnesium can also help prevent calcification (hardening) of blood vessels and thereby help prevent heart disease. 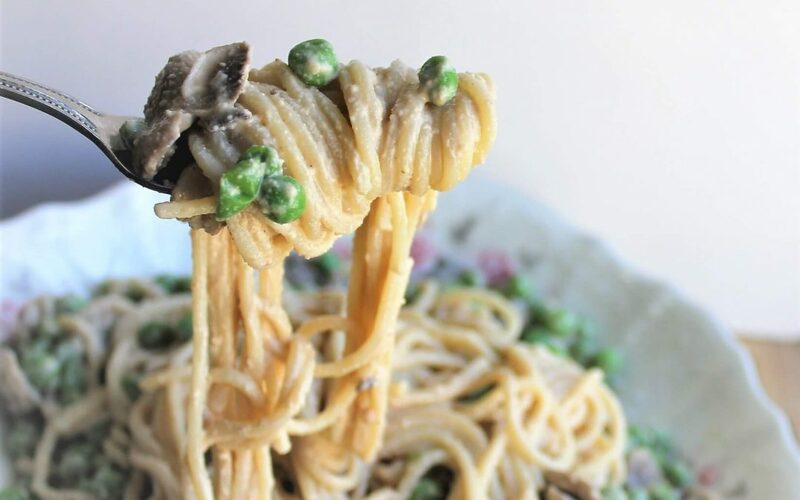 I added peas for a boost of plant based protein and I threw in mushrooms for that umami flavor we all love. It’s a real winner! Try it for yourself and see! 1 16 ounce package of thin spaghetti * for a truly vegan dish use egg-free pasta, otherwise you can really use any pasta you want. Place cashews, almond milk, nutritional yeast, lemon juice, garlic, salt, and black pepper in a food processor and blend until smooth. About 5 minutes. Set aside. Remove stems from mushrooms and thinly slice the caps. Place in a pan over medium heat with 1 tablespoon oil (preferably avocado oil) and cook until golden brown and all juice from mushrooms has evaporated. Set aside. Prepare pasta per package instructions. Drain water. 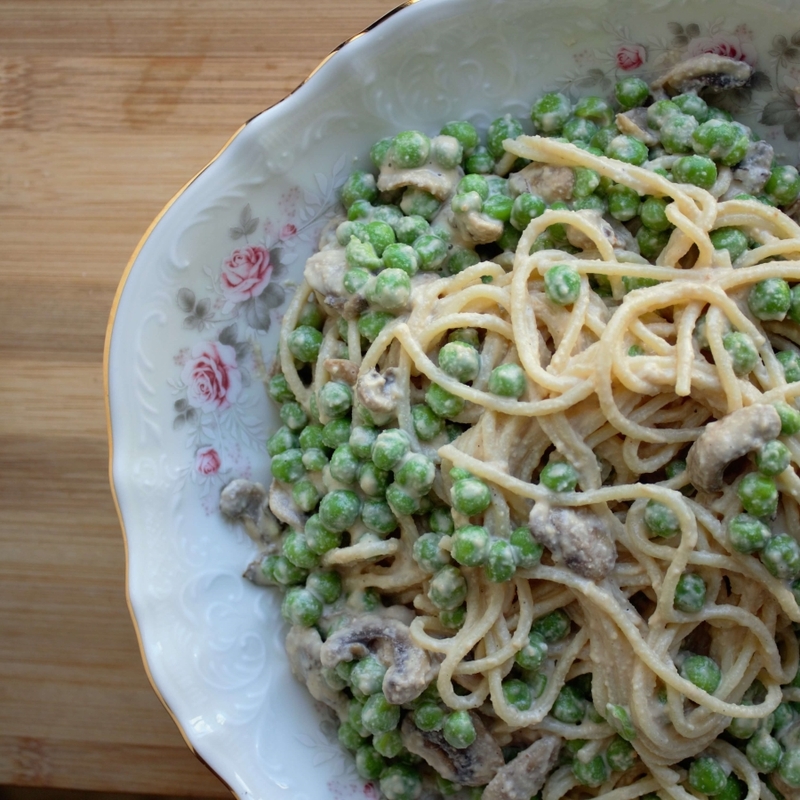 While pasta is still hot combine mushrooms, peas, and enough alfredo sauce to coat all components. Serve right away, this dish is best when it is still warm! Feel to use any pasta of your choice. It also pairs fabulously with gnocchi. You may have some leftover sauce. Store up to 5 days in an air tight container in the fridge. It is best to eat this dish when it is hot and freshly made if you want to enjoy it super creamy. If you have extra sauce use it over nachos or as a dip for veggie sticks – mmm, so good!! Enjoy!